Hey there race fans! Ok, more than likely you’re a Sari fan. And if like me, you prefer enjoying a 6-day, 450-mile adventure race from the comfort of your couch/desk/smartphone, I’m here to help. For the next few days, I’m going to hijack my lovely wife’s website and attempt to provide somewhat regular updates on the race in Tasmania. The race includes trekking, mountain biking, sea kayaking, rafting, caving, abseiling, navigation and more. The race director predicts it will take the top teams six days to finish (Monday morning local Tasmania time). 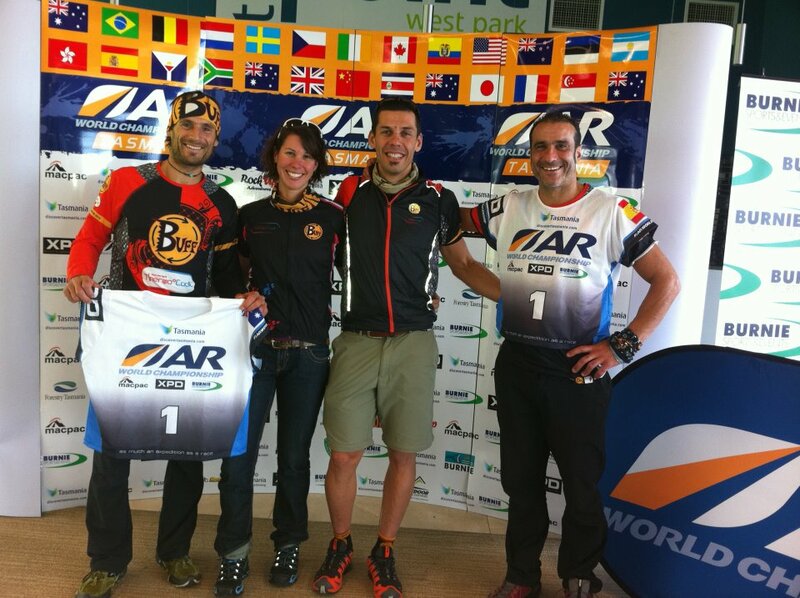 Sari’s teammates are the reigning world champions hailing from Spain and France. Here’s their Facebook page. And here’s a blow by blow description of the course. The race started today, or tomorrow at 9am if you live in the Australia Western Time Zone. I’m not sure it’s fair, but somehow those Aussies/Kiwis get to live their lives a full day and a half before us. But I digress. The race began on Wednesday morning local time with a 17km sea kayak leg followed by a clay pigeon shooting challenge, where one teammate had to hit one of five targets. I’ve seen Sari shoot an air rifle and she couldn’t hit a chipmunk if it were gnawing on her foot. Unfortunately, it seems her teammates are as bad a shot as she is and they failed the challenged, which resulted in a 10-minute penalty. No big deal in a race this long. The team is now off on a trek, followed by a mountain bike ride and then a caving adventure(!?). I suspect the top teams will stick pretty close together in these first few days and the race won’t really start to shake out until day 3 or 4 when sleep deprivation and fatigue really set in. From what I can tell, the favorites in the race are Team Silva (#9), Team Seagate (#2) and Team Blackheart (#3). But, this is adventure racing and mechanicals, injuries and sickness can slow down even the fastest, best prepared teams. I’ll try to post updates daily here, but if you want to follow along with the race and join me in yelling at your computer screen when our team takes a wrong turn or is moving slow, here are some options. Wish the team luck on the race message board here. The teams actually have to stop and blog at several points during the race. Once I find those posts, I’ll be sure to share them. Otherwise, thanks for following and supporting Sari!